Glenn Irwin will ride in tomorrow’s opening Bennetts British Superbike race despite fears he had broken his neck after a free practice crash. The Ulsterman came down heavily when he highsided from his Be Wiser Ducati towards the end of this morning’s opening practice session and was taken to hospital with a suspected broken neck after X-rays in the circuit medical centre. 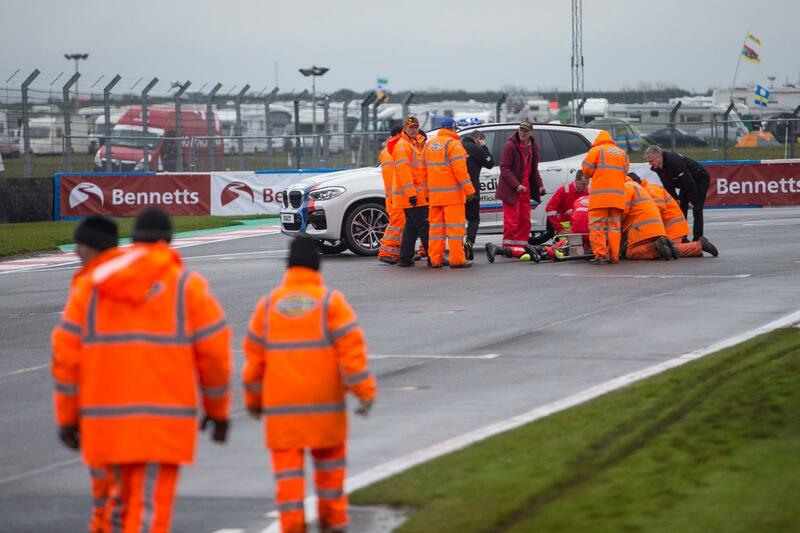 However, following further checks at Queen’s Medical Centre in Nottingham, doctors were able to establish that the bone broken in the neck was an older injury sustained in his Knockhill practice crash last year. Irwin underwent further checks on his back before leaving hospital and returning to the circuit, where medical staff passed him fit for tomorrow’s action – which now features the first race of the season after organisers confirmed a schedule change in light of Monday’s weather warnings. “It was a strange crash but conditions were difficult,” Irwin said as he returned to the circuit. “I wasn’t going any quicker than I’d done all session, I was on an out lap, but as soon as I touched the throttle it came around and flicked me. I was quite badly winded and had a lot of lower back pain, I was convinced I had broken my back. “I was surprised when I was told I had a broken neck, which was confusing as I didn’t have any neck pain. When the hospital took a look they were able to say it was an old injury, which must have been caused in my crash at Knockhill last year.